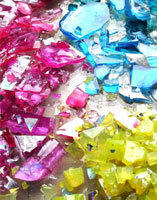 Colour remains the main focus and inspiration for new designs, ideas for which may come at any time, and anywhere. For example, my range called “Dolomiti” was inspired by the setting sun against the stunning pink Dolomite mountains of Northern Italy in winter. I do not seek to copy what I see, rather to use it as a starting point which then evolves into a new design. Sometimes a range will simply be the result of creative ‘play’ and experimentation with the raw materials which are to hand in the workshop. This is a process which I have always felt to be exciting, and which probably has its roots in my training as a sculptor. Often the freshest work can result from a session of experimentation, when I get ideas from seeing the vibrancy of colours as they interact one against the other.